What do Eight Row Flight, worms, foie gras, mullet, and soil all have in common? They are all things that I couldn’t have imagined in a million years that I would read about or even care about. 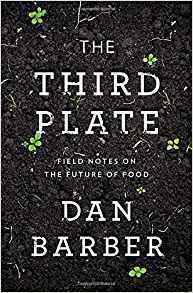 But, since reading The Third Plate: Field Notes on the Future of Food by Dan Barber I do care. And frankly, I wish I could go back to my state of ignorance is bliss. Reading this book will forever change the way you look at food, farming, and consumerism. I received this book as an advance uncorrected proof through a www.goodreads.com giveaway. Like many of the giveaways, I’m not sure what drew me to the book. When it arrived in the mail I put it on the shelf for later, mostly because it was visually intimidating. It isn’t a small book and there are very few pictures or diagrams. It just felt overwhelming. Fortunately looks CAN be deceiving. It reads quite easily and although it contains a great deal of technical information it didn’t really cause the book to bog down for me. I have already passed it along to a friend. It was really that informative and good to read. After finishing the book I made some life changes and have continued to incorporate the information into my life. The book confirmed what I already knew – fresh produce from an organic garden tastes better than the store-bought produce (even the organic stuff). Now I know why, companion planting and crop rotations. I also have suspicions about the origins of my food allergies and gluten issues. I found it difficult to read about the corn, wheat, and soy because, in my mind I have vilified these substances as culprits in my own health issues. The realization that the grains I have consumed have no real resemblance to REAL corn, wheat, and soy and that this imposter phenomenon is what has made me sick actually makes me quite angry. I’m pretty sure that my consumption of meat will continue to decrease and change. The book speaks to the conceptual and global issues related to farm-to-table eating and sustainable agriculture; however, it leaves me feeling very challenged about how to put this knowledge into practice. Short of growing my entire food supply myself (not feasible), I don’t know the best way to move forward on some of these issues. Imagine the look on your grocer’s face when you ask not only how fresh the fish is, but also where it was caught and how it was killed. Or better yet, ask what was grown in the field along with my tomato. And by the way, what crop was grown in that field the previous year? I highly recommend that you read the book. Maybe your food habits will change. Maybe they won’t. But I am certain that your view of food WILL change.